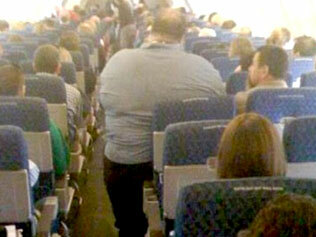 A passenger on a US Airways flight said he was forced to stand for seven hours after he was squeezed out of his seat by an obese man sitting next to him. The incident occurred on July 29 and was first reported by Elliott on Tuesday. Berkowitz said he alerted flight attendants to the problem, but they were unable to accommodate him, according to his account on elliott.org. “They were sympathetic, but they could not do anything. No other seats existed on plane. They would not permit me to sit in their jump seats, and fully acknowledged the mistake by their gate agent, in allowing this individual on plane without requiring him to purchase and occupy two seats,” he said. "His seatmate had the same right to his seat as Mr. Berkowitz did to his. So here’s where the diplomacy and cooperation of all passengers comes into play,” the airline said in a statement. Berkowitz was unhappy with the $200 voucher the airline offered him for his experience, at which point he contacted Elliott. "We have attempted to address this customer’s service concerns,” the airline statement said, “but offering increasing amounts of compensation based on a threat of a safety violation isn’t really fair — especially when the passenger himself said he didn’t follow crew members’ instructions and fasten his seatbelt.